Enhance your adventure thanks to the Starlink: Battle for Atlas Controller mount pack. In Starlink: Battle for Atlas, you can invite a friend to join the campaign seamlessly at any time. Thanks to the two-player split-screen local co-op, combine different load-outs for the ultimate teamwork to save Atlas together. 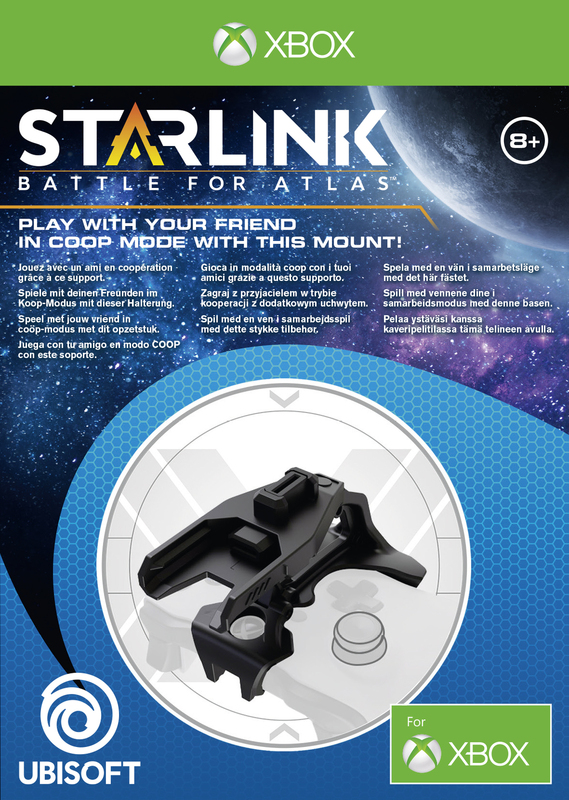 Starlink: Battle for Atlas Controller mount pack offers you a second controller mount to play with a friend in the local coop mode. The Starlink: Battle for Atlas starter pack is required to play with Starship, Pilot and Weapons packs. All Starlink modular toys only work with Starlink: Battle for Atlas™video game and controller mount on Xbox One. In Starlink: Battle for Atlas, lead a heroic team of interstellar pilots to free the Atlas star system from the Forgotten Legion. Innovative modular toys allow you to build unique starships that can be customised on the fly for a new way to play as you adapt to overcome any challenge you encounter in this epic open world adventure. How do you play with your modular toys? Connect your modular toys to your controller mount and see them come to life in real time in the game! Craft your own starship load out from your arsenal of wings, hulls, weapons, and pilots. Adapt to any challenges you face in real time.